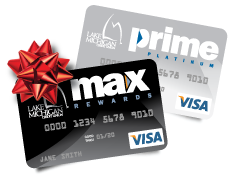 Nothing stretches your holiday budget dollars like a Max Rewards or Prime Platinum Visa card! With 3%* cash back or points on gas, 2% on groceries and 1% on everything else, Max Rewards makes your holiday dollars go further. And new accounts get 1,000 bonus points with the first purchase! Do you usually carry a monthly balance? Prime Platinum, named by Money Magazine as one of the best credit cards in the nation,** features rates as low as prime plus 3% — and no annual fee. And right now, if you open either a new Max Rewards or Prime Platinum credit card account before December 31, you’ll get an introductory 2.99% APR rate on all purchases for 12 months. *** After that, the regular purchase APR, currently as low as 10% APR for the Max Rewards card and 6.25% APR for the Prime Platinum Visa card, apply. *Maximum earned on first $500 spent on gas/ month, 1% after maximum is reached. **Money Magazine, October 2013. ***Excludes existing LMCU balances.